Haiti is the poorest country in the Americas. To make matters worse, natural disasters have devastated the lives of vulnerable families and children. In 2010, an earthquake destroyed vast parts of the country. In October 2016, Hurricane Matthew struck Haiti, leaving thousands of families without food or water, causing severe damage to infrastructure and claiming the lives of hundreds of people. SOS Children’s Villages runs schools throughout Haiti (photo: D. Pereira). The Republic of Haiti has a total population of about 10 million, with approximately 900,000 living in the country's capital, Port-au-Prince. Its official languages are Creole and French. Haiti has undergone decades of poverty, economic dependence and political instability. It is now the poorest nation in the Americas. Natural disasters have also affected the lives of vulnerable families and children. In January 2010, a massive earthquake struck Haiti and killed an estimated 220,000 people. Hundreds of thousands lost their homes, and many families have yet to recover from the devastation. To make things worse, the earthquake was followed by a cholera epidemic, Hurricane Tomas, and controversial presidential elections that caused further chaos. In October 2016, Hurricane Matthew struck the southwest coast of Haiti. It caused widespread damage and flooding, which affected around 2.1 million people. Directly after the hurricane, there was an urgent need for shelter, food, clean drinking water and medical care. The damaged infrastructure and the contamination of the water sources led to a rise in cholera cases. Historically, Haiti has always been a country with a significantly uneven distribution of income. 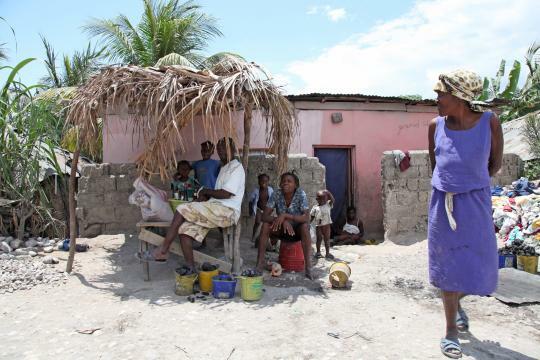 Approximately 80 per cent of Haitians live in poverty, most of them under precarious conditions. They face a life without proper sanitation, electricity or running water. The situation is worst in rural areas: people here have about a third of the income of people living in urban areas. Access to basic services is limited: 52 per cent do not have clean drinking water and 80 per cent do not have proper sanitation facilities. HIV/AIDS infections had already been one of the leading causes of death prior to the earthquake. After the disaster, they posed an even greater threat. 2.1 per cent of the population has HIV/AIDS - this is one of the highest rates in the world. After Hurricane Matthew, SOS Children's Villages distributed food to local vulnerable families near Les Cayes (Photo: M. Eliscar Getro). The critical economic and social situations, as well as natural disasters, have put hundreds of thousands of children at risk. Haiti has the highest infant mortality rate in the Americas: Preventable illnesses, such as cholera, tuberculosis and pneumonia are the main causes of deaths in children. Around 100,000 Haitian children aged between 0-17 have lost parental care because of AIDS. Only one in five children starts secondary school. Many drop out of school in order to work. According to the United Nations, roughly 300,000 children in Haiti work in conditions similar to slavery. After Hurricane Matthew in 2016, an additional 130,000 children were out of school and 10,000 children were in need of protection from exploitation and abuse. SOS Children's Villages began working in Haiti in 1978. Strengthen families: We work with the local communities and organisations to ensure that families who are at risk of breaking down can stay together. We provide different help, depending on the needs of the family, but this can include medical care and counselling, as well as nutritional and material support. Care in SOS families: If, in spite of all assistance, children cannot continue to live with their parents, they find a home in an SOS Children’s Village. Brothers and sisters grow up together in a family, and are cared for by an SOS parent. Support for young people: The economic situation and high unemployment rate makes it difficult for young people to become independent. We support young adults with training and accommodation until they are able to live on their own. Education: We run primary and secondary schools for over 2,200 children in Port-au-Prince (SOS Children’s Village Santo), Cap Haïtien and Les Cayes. Children from the local community attend alongside children in the care of SOS Children’s Villages. Vocational training: In Cap Haïtien, we also offer vocational training so that young people can make a living. We offer courses where young people learn skills to set up their own businesses or find a job. Emergency Programme in response to Hurricane Matthew: SOS Children’s Villages offered immediate emergency assistance to local families. In addition to repairing schools and community centres, we distributed food to over 520 families in the first month. Over 2,000 families have received information on child protection and health care. Around 500 children suffering from trauma have received psychological care. In the next few months, we will work to ensure that families can provide and care for themselves.